When Focus Features reached out about a press opportunity involving LAIKA—America’s premiere stop-motion animation studio—and its latest film offering, Kubo and the Two Strings, my first thought was Cool! But what’s the fashion angle? And that’s when I learned about a little-known design career and the über-talented woman behind it. 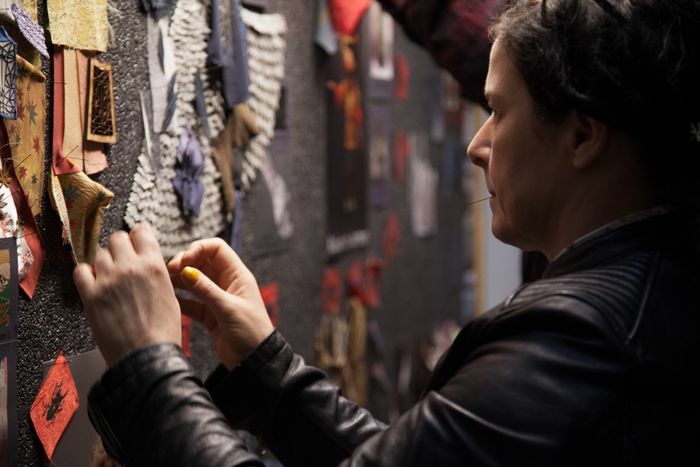 On the quick trip to Portland, Oregon, I would meet with LAIKA’s resident costume designer, Deborah Cook. Having worked on such celebrated stop-motion films as Corpse Bride, Coraline, and The Boxtrolls, to name a few, the London native specializes in making pint-size costumes. But as I would quickly learn, her job is no small matter. From conceptualizing a character’s sartorial narrative to physically making each piece of clothing (with some looks requiring up to 30 duplicates! ), costume design on a this scale can be as demanding and time consuming as the animation itself! Arriving at the studios, we were given a rare peek at the design process behind the incredible costumes of LAIKA’s new fantasy action thriller Kubo and the Two Strings, which stars Charlize Theron and Matthew McConaughey and is in theaters today. After walking us through giant inspiration boards, complete with sketches and fabrics, and showing us how some of the looks are brought to life, we sat down with Cook to get the scoop on her awesome job. Keep reading for our exclusive interview. WHO WHAT WEAR: How did you end up in costume design for stop-motion animation? DEBORAH COOK: I was at Central Saint Martins art school, and at that time, it was in the middle of SoHo in London and was mainly known as a fashion college. I had a fascination with [fashion] before I did fine arts sculpture, but I really wanted to do art. I used a lot of fabrics in my artwork. I did instillation pieces that involved abstract figurative characters with upholstery and sculpting abstract body shapes and putting fabrics onto them. So my sculpture was already leaning in that direction. And then being in the middle of SoHo where there are lot of film companies, they used to come around the college and ask us to make things for films and commercials with no budget. It was a very good training ground. As I was leaving college, people just carried on asking me if I could make things, mainly the animation industry asking me to sculpt puppet bodies and make their costumes and hair. Because I had worked in such fine detail in my own personal work, it translated quite conveniently. WWW: What’s one part of your job that would surprise most people? DC: I think it’s the kind of fabrics we use. They are not unusual fabrics, but they have to have a very particular quality for us. And the way we invest the engineering in them and work the fabrics to make them look like costumes is very different from regular costumes. Also, I do a lot of writing. You have to find a voice for the costume, like an actual literal voice and try and break down what you’ve actually done. I make a lot of notes as I go on; I list everything I’ve researched, every topic that I’ve gone into. I keep it all listed. You have to keep everything well-organized, because you have to have a massive administration system behind you to catch everything, so to speak. If I research something random and it pulls something really good, I’ve got to know absolutely where that is, how I can find it again, how I can document it, and how I can explain where I entered the process. WWW: What do you find is most challenging part of your job? DC: I think it’s the amount that we have to produce in the timeframe. Even though we spend longer on our films, we do a lot of characters, and they all have to be built and all have to look great. They have to interact with each other, so even if it’s a background character, they need to be invested with all of those design considerations as well. You don’t want someone looking crappy against a lead character. You want every frame to look great. Sometimes the pace seems slow to the outside world, but the level of detail we go into, the pace is pretty fast. WWW: Let’s talk about Kubo and the Two Strings! Can you tell us about the kind of research you did for this film? DC: For our previous films, we’ve really focused on tailoring, but for this one, we knew it would be completely different. It was a bit of a double-edged research. One part was the history of Japanese clothing and costume and how we were going to represent that and how it was going to enhance our characters. So looking into the color language, how things were worn, what was age-appropriate, and the significance of using, say, cherry blossoms or the color red, which had a huge significance historically in Japanese clothing. And also the narrative of kimonos. Kimonos are woven flat and some are hand-painted, so they are in different scales across the kimono, kind of like a wraparound narrative, so they are not identical on both sleeves. We brought that into Mother’s robe, where she has the maple leaves that start at the top in really lovely oranges and pinks, and as they fade down the train become very autumnal, broken, and brown to represent her life span and narrative within the story, which is really quite sad. And then the other side of it is how do we make these costumes work? How do we make big, billowy sleeves not float or flap around in the camera? We had to work from scratch on that. A lot of those costumes have got real armature in them, as well as the puppet armature. WWW: Did you look to any current designers or runways? DC: I did look at Issey Miyake’s work. I went to an exhibition of his in Seattle actually, and there was something in there, it was a folded flat piece of fabric, but as you picked up the top, it turned into a skirt. All those folds had been carefully placed so when it’s upright, they are contoured around the body and drape very elegantly. Each time a person moves in that skirt, the folds would stay in the same place and still contour the body, so that really helped inform how we might make our sleeves work, make the big drapes work, and the trailing trains. I also looked at old Japanese woodblock artists, like Yoshitoshi and Kiyoshi Saito. Yoshitoshio, some of his woodblock prints have really sharp angles and folds and they are very dynamic and energized. And there was just something in those two things that I felt was really going to work for our big drapes, and then we would just have to put them together in practice and actually try and make those things work practically. WWW: Do you have a favorite costume from the film? DC: I have favorite elements of all different kinds of things, but I have to say the lead characters are always the biggest challenge, and I do enjoy a challenge. So I would say the lead character, because everyone’s expectations are hanging on that, and when we’ve resolved that lead character, which is always our first character, they kind of inform the rest. WWW: On average, how long would you say it takes to develop a main character’s costume? DC: It’s months. I work for five to six months doing the research before we starting anything, and that generally gives the flavors to what we want the costumes to look like. And then we have several months of development time actually building the costume design and doing the costume and animation tests. WWW: How many versions of a single costume do you end of making for a character? DC: For a lead character, it can be somewhere around 25 to 30 duplicates. Some of those are in different versions, different states of disarray, like when Kubo is in battle. There is certain wear and tear that has to be duplicated, so there will be several duplicates of those as well. WWW: What do you do when you are feeling uninspired? DC: I get itchy feet quite a lot, actually, and have to go off to art galleries and exhibitions and order myself lots of new books and travel and go to inspiration fittings. I think that was the fun of Kubo, was being given a free range to go and explore something new. I went to Tokyo, which was marvelous—I loved that. So all of those things, just finding new ground all the time is really inspirational. And just keeping the finger in different pies, like looking at contemporary artists, textile artists, fiber artists, and also new designers. WWW: What advice do you have for someone looking to get into costume design, whether it’s on a smaller scale or something much bigger? DC: I would actually say to start making things right away. Just follow your instincts. Stay diligent. Stay focused. Just keep going, don’t give up, and literally doing something every day that takes you to where you want to be. And also, just learning pattern-cutting skills is really essential, and being able to dress any which way shape you come across. A lot of our puppets are not regular shapes; their bodies are not in perspective to a human body, so you need to know how to make those adjustments. Grab your tickets for Kubo and the Two Strings today. For more exclusive costume features, don’t miss our interviews with Colleen Atwood and Sandy Powell.